Although most patients are interested in augmenting their lips, some patients are interested in making their lips smaller. This is more common in certain ethnic or racial groups and is popular with men and women. Some patients also have lip enlargement due to trauma and this can be treated similarly. At the consultation, the Dr. Niamtu explains the procedure to the patient and discusses how much smaller the lips would be. Since you can always take more away, it is always better to error on the conservative side. This means that some patients may require a touch up procedure to further reduce the lip size, but this has been rare. The procedure can be performed with local anesthesia or IV sedation and takes about 25 minutes per lip. The goal of the procedure is to remove a wedge of skin from the inside of the lip. By placing the incision in this area, the scar will be hidden. 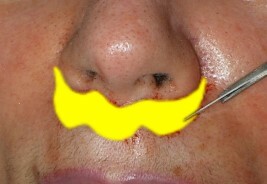 After the wedge is removed, the area is sutured together which allows the lip to roll back reduce its profile. 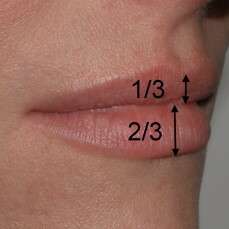 Figure 1 shows the intended area of skin excision to reduce the bulk and volume of the lip. The recovery is variable but generally takes about a week. Swelling and discomfort are usually moderate although some patients may experience significant swelling which resolves with anti swelling medication. In the early post operative period, patients should refrain from excessive oral function. Some swelling may persist for several weeks. 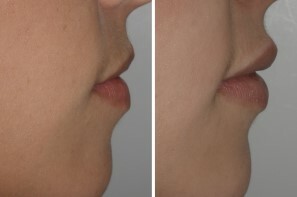 Figure 2 shows a before and after picture of lip reduction. 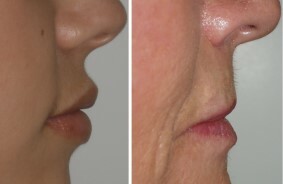 Although different from lip reduction, another procedure is used to shorten the upper lip known as a “subnasal lift” or a “bullhorn procedure” (due to the outline of the incision resembling horns). This procedure is used for patients who have an elongated lip and do not show any of their edge of their front teeth when they talk. Most female patients show several millimeters of tooth structure when talking. Failure to show any tooth edge gives the appearance of a “denture smile” or an older appearance. As we age, the lip becomes longer and loses its form. 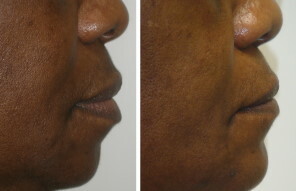 With the subnasal lift, a curved area of skin is outlined and removed where the lip skin meets the nose. 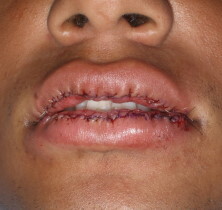 After the excess skin is removed, the incision is closed which not only elevates the lip but also causes the lip to “roll out” giving it a more pouty appearance. 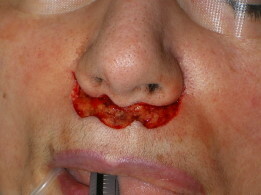 Figure 3 shows the area of skin excision used in the subnasal lift. 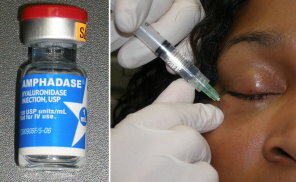 Figure 4 shows a before and after image after a subnasal lift. 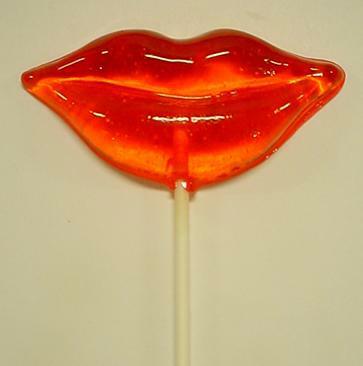 Note that the elongated lip is shortened and now has more pout.